Built in 1903, the Alberta Hotel was considered Edmonton’s most fashionable establishment. 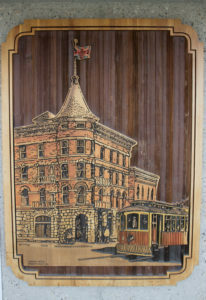 Located on the corner of 98 Street and Jasper Avenue, it boasted the finest bar and restaurant in the district, as well as Edmonton’s first passenger elevator, shower baths, and a call-bell system that linked rooms with the front desk. The building was constructed in Victorian Romanesque style, and built with local pressed brick (a flourishing industry in early Edmonton), and Calgary sandstone. In 1984, the hotel was demolished to make way for Canada Place, with intent to reconstruct it at some point in the future. A $1M trust fund was established to fund this future project. The building’s bricks and sandstone blocks, as well as the turret and other architectural remnants were numbered and stored. Unfortunately, plans stalled and the future of the hotel became uncertain. Eventually, prominent architect Gene Dub began the tentative process of reconstructing the building. The former Charles Camsell Hospital became the setting for 2,000 stones and bricks that were laid out on the floor and pieced together like a jigsaw puzzle, eventually becoming the façade of the south and west walls of the new hotel. The cupola of the hotel was also rebuilt. Resurrected one half-block east from the original site, the repurposed building opened in 2012 with many historically accurate design finishes, including the cash registers and human-sized urinals. It is now home to CKUA Radio Network and the Alberta Hotel Kitchen & Bar. The hotel officially reopened in 2015.